It’s our carpet, yeah that’s right! I personally love my carpet by the way, it’s one of the warmest places in my house during winter. We do know that our carpet has lots of germs and bacteria living in it. We usually clean our carpet by a normal vacuum cleaner, but that doesn’t help to destroy all the bacteria and germs inside it. Therefore, we use professional help for it. Wait a second! Did I just say professional? After reading this you might wonder why would I waste a few bucks to clean a stupid carpet? But it is what our very own vacuum cleaner helps us to clean the carpet only on an outer level which makes it easier for any kind of a bacteria to stay safe and attack its victim whenever it gets a chance. So, to get rid of these bacteria we need a professional help from the, ‘Carpet Dirt Busters’, I mean professional carpet cleaning. They have these cool steps to clean the carpet and give it a new feel. Let’s check those steps which may remind you of a classic “Ghostbuster series”. Professional Carpet Cleaning is what we need to be able to get rid of those dirt and bacteria and make our carpets feel as good as new. Have you thought about trying them out yet? So, this it, now whenever you need a carpet to be cleaned you remember. “If a carpet is dirty, who you gonna call? 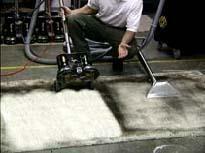 Carpet Dirt Busters!” I mean Professional Carpet Cleaners in Mullica Hill, NJ.